If space is at a premium in your house, then this great little “fold away” desk is for you. Flip it out, fire up the laptop and you have an instant home office! This fold-out desk is great if space is at a premium at your home! 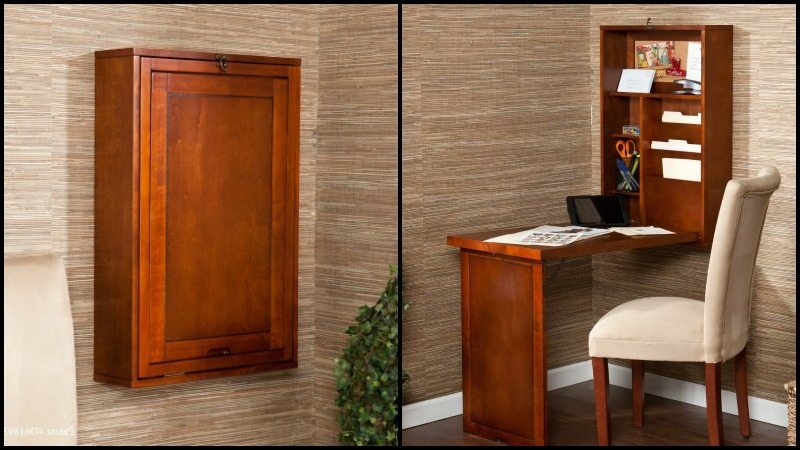 This fold-out desk features three bill organizers, two adjustable shelves, two fixed shelves and one cork board. The work desk itself is 30″ x 20″ which provides ample work area, while the desk height measures 28.5 inches. It is easy to use, although a little caution should be taken when trying to open or fold away the desk as you can get pinched if you are not careful. Nevertheless, this space-saving fold-out desk is really great as anybody can use it anywhere for any purpose! You can do your crafts here or use it as a sewing table. Even kids can use it comfortably as their study table. It’s also great as a table for one in the kitchen! Is this the kind of desk you are looking for? Get yourself one now before stock runs out!